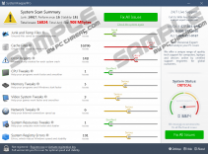 SystemKeeperPro claims to be a “9-in-1 ultimate tool” that can optimize your PC and boost its performance; however, our research and tests indicate that this is just another potentially unwanted program (PUP) posing as a PC optimizer. We have seen the like in the past, including Super System Optimizer, Super PC Cleaner, and System Care. This questionable software scans your system and displays thousands of errors that need fixing just to persuade you to buy the full product. However, we have found that this PUP may only delete temporary files and empty registry entries, which will not make any difference really regarding the performance of your PC. All in all, we suggest that you remove SystemKeeperPro from your system. For further details about this potential threat and how you can protect your system from similar or worse infections, please read our full article. The official source of getting this questionable program up and running on your system is none other than its own promotional website, systemkeeperpro.us. This is quite a simple website, but at least, in all fairness, you can download this PUP without security tools blocking it as a potential threat, which could happen in similar cases. But user reports and our research also show that this is not the only way this useless free program can show up on your system. Unfortunately, there is a way more questionable way, which is also riskier. We have found that this PUP can travel the web in freeware bundles that may contain a couple of malware infections, including adware programs, browser hijackers, Trojans, and potentially unwanted applications. It is possible to infect your computer with such a package after you click on unreliable third-party ads. This is easier than you may think. For example, it is quite likely that you will find at least one adware program on your system if you infected your computer with this PUP. An adware app can display all kinds of annoying third-party advertisements while you are browsing the web. However, not only are these ads annoying but they can also embed corrupt links leading to malicious websites or directly drop infections onto your system. The same can happen when you are viewing an unfamiliar suspicious torrent, freeware, or gaming website. These pages host an annoying number of potentially unsafe third-party ads. It is enough to click once on the wrong content and you could download a whole package of malware threats. What a lot of users may overlook is the last opportunity to save your computer from an invasion. This is usually the first step during the installation of a bundle where you have a chance – if revealed – to deselect the unwanted components that you do not wish to install. Unfortunately, it is possible that certain third-party installers do not even reveal the full and real content in order to make sure that they infect you with a number of malicious programs. All in all, we recommend that you delete SystemKeeperPro from your system if you have made up your mind. This PC optimizer offers you faster performance, error free system, quicker startup times, and so on. When you install this program, it performs a system scan and may return with thousands of alleged system errors that need immediate fixing. The free version offers you to fix 10% of your issues. However, if you want to use this PUP as a fully functioning program, you need to buy a license, which costs around $30 per year. But before you start thinking that this may not be a bad price for an optimizer, let us tell you that this software may only delete temporary files and empty registry entries, which do not really matter anyway. This will not substantially improve your PC’s performance; if at all. We do not think that it is worth paying for such software that does not even boost or protect your system properly. For this price you may find a decent anti-malware program that could do you a much better favor. But it is, of course, your choice to make. We still advise you to remove SystemKeeperPro from your PC. 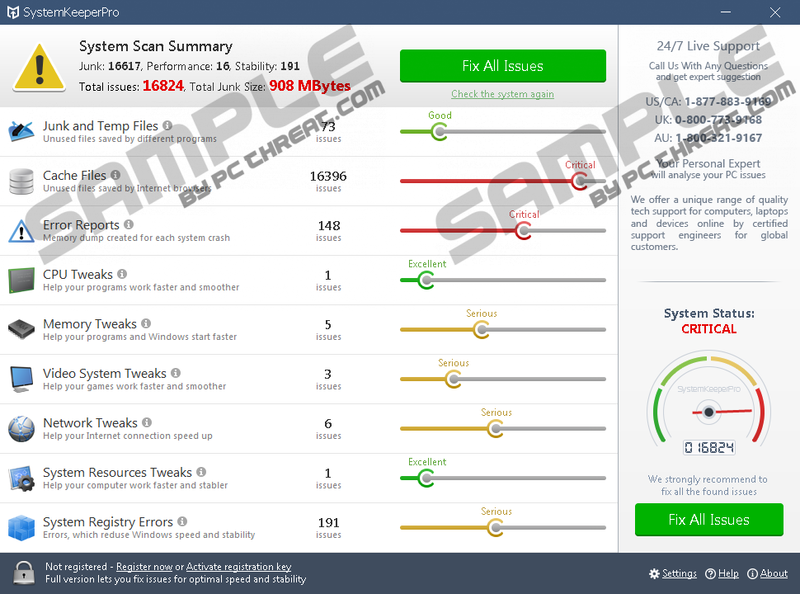 We cannot claim that this supposed PC optimizer PUP may cause you serious security issues even indirectly, but we do believe that your system would be safer without it. In order to clean this software from your PC, you need to locate its uninstaller via Control Panel and run it. If you are unfamiliar with this process, please follow our instructions below. It is important for you to remember that there could be more dangerous threats on your system that need your attention, too. If you would like an effective automated method to handle this situation and protect your system from further attacks, we suggest that you use a reliable anti-malware program, such as SpyHunter. Select uninstaller and click Uninstall. Access the Start menu on the Taskbar and select Control Panel. Press Start and open Control Panel. Select uninstaller and click Remove. Quick & tested solution for SystemKeeperPro removal.